In 2007, the year in which the Society of Antiquaries of London celebrated its tercentenary, what more fitting tribute to those industrious individuals than that their work be made accessible to a new generation of students. One means was by a celebratory exhibition hosted by the Royal Academy, Making History: Antiquaries in Britain, 1707-2007, which showcased a treasure-trove of art, antiquities and manuscripts (for review, see Mount 2007). Structured display is one thing: scholarly use or re-use of antiquarian data is, however, quite another matter. Indeed, therein arguably lays one of the more pressing challenges facing the practice of 'modern' archaeology (see Jones et al. 2001). A timely response was the online publication in October 2007 of the Novum Inventorium Sepulchrale (NIS), a digital corpus of Kentish Anglo-Saxon graves and grave goods. Through this project a wealth of primary data has been made accessible as never before. This resource will be of interest to all those researching Anglo-Saxon Archaeology, particularly material culture and mortuary practices. Whilst the editors express the hope that the NIS will 'enable future generations of researchers to gain a better understanding of the origins of the Anglo-Saxon kingdoms', users will find themselves both delighted and frustrated by the quantity and format of the data presented in it. Figure 1. 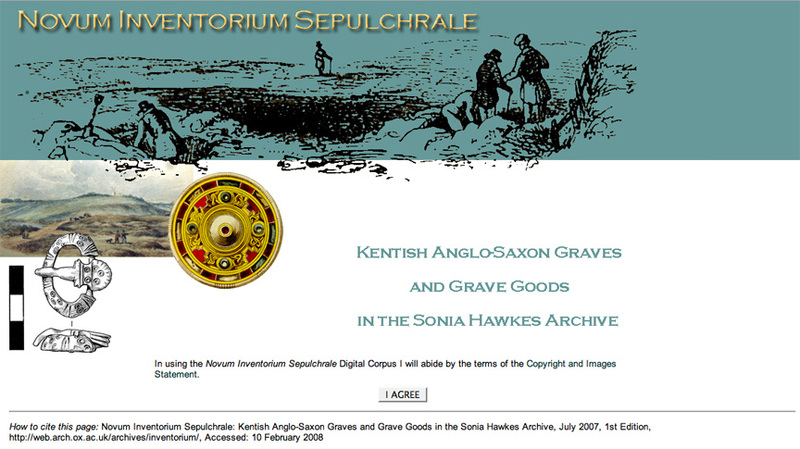 Introductory interface of the Novum Inventorium Sepulchrale, an online digital corpus of Kentish Anglo-Saxon graves and grave goods. Ostensibly the digitisation of Charles Roach Smith's edition of Bryan Faussett's eponymous Inventorium Sepulchrale (1856), the aims and success of this AHRC-funded project (directed by Prof. Helena Hamerow and based at the Institute of Archaeology, Oxford) are, however, far greater in scope. In effect the NIS has proved an informative exercise in historiography, demonstrating the vicissitudes of Anglo-Saxon Studies from the late eighteenth-century to the present day. Moreover, it provides grounds for reconsidering the way in which our data is captured, curated and disseminated. Not least because Anglo-Saxon Studies are, albeit timidly, coming to embrace digital technology, it is now time to rethink the Anglo-Saxon cemetery report as genre. Bryan Faussett was a prolific, although by no means profligate, barrow digger of the late eighteenth century; between 1757 and 1773 he excavated some 750 Anglo-Saxon graves from the Kentish Downs, which he recorded in detail. However, it was not until 80 years subsequent to his death and under the diligent editorship of Charles Roach Smith that Faussett's Inventorium Sepulchrale (1856) was published to a wider audience¹. And here our story might end (as is the case for so much work conducted in the eighteenth and nineteenth centuries) with limited publication and volumes accessible in a restricted number of libraries ... if, that is, it were not for the vision of the indefatigable Sonia Chadwick Hawkes. In the early 1960s, Hawkes recognized the 'need to re-publish these important and remarkable finds to a modern standard' (NIS; emphasis added). The NIS from its inception was to be no mere facsimile. To this end she set about supplementing Faussett's text with a fresh catalogue of the extant artefacts, not only from his excavations but from subsequent nineteenth- and twentieth-century interventions. Detailed written and photographic documentation was undertaken with commissioned line drawings by Marion Cox. With the burgeoning of the archaeological sciences during the early stages of the project, x-ray and metallurgical analyses were also introduced. Furthermore, the addition of up-to-date bibliographic references has, most fruitfully, linked eighteenth to twenty-first century scholarship. The result is a voluminous archive of 153 x-rays, c.1500 drawings, c.300 colour photographs and some 2000 b/w negatives. For Hawkes, the challenge was "to incorporate all the new information from modern excavation and research while retaining, as Charles Roach Smith did, the integrity of the original diaries" (Hawkes 1990, 23). Grand ambition, indeed. No less because the project had originally been envisioned as a component in a larger national Corpus of Anglo-Saxon Graves and Grave-Goods. Nevertheless, on her death in 1999, Hawkes' vision remained unfulfilled. It was thus left to her literary executors, Helena Hamerow and the late Jean Cook, to realise the potential of the archive that Hawkes had created during some thirty years research and which is the cumulative result of over 200 years of Anglo-Saxon Archaeology in Kent. Indeed the achievement of the NIS should be measured alongside the posthumous publication of Hawkes' own excavations at Bifrons (Hawkes et al. 2000), Worthy Park (Hawkes and Grainger 2003) and Finglesham (Hawkes and Grainger 2006). Hawkes had been thwarted, however, not by the ambitious nature of the project, but rather by the limitations of her day. In many respects her plans simply were not achievable in her own lifetime, circumscribed by the cost and rigid format of tradition publication. Only with the exponential growth of the internet in the decade following Hawkes' death and the opportunities it affords for the long-term curation and international dissemination of archaeological data (cf. the success of the Archaeology Data Service) has the NIS as an online digital corpus been made possible. However, it should be noted that just as publication in hardcopy is governed by convention and pragmatic constrictions, so too in softcopy. a) What of the proposed national Corpus? b) Is there such a thing as a commonly agreed set of 'modern standards'? In the first case, the argument has often been put forward (though hitherto little advanced) for the construction of a national database of Anglo-Saxon cemeteries (Huggett and Richards 1990; Lucy and Reynolds 2002, 7) - an 'invaluable research tool' not least because those of us researching Anglo-Saxon mortuary practices are each re-creating computerised databases from essentially the same data base. The online publication of the NIS certainly provides an exemplar and it is to be hoped a spur for similar regional studies to be undertaken in the future. An ideal companion and indeed comparison to Kent would be East Yorkshire; secondary works of synthesis by Sam Lucy (1998; 2000) and Jo Buckberry (2004) provide a point of departure for focused study of the Mortimer Collection, recorded in J.R. Mortimer's Forty Years' Digging (1905) and residing in the Hull and East Riding Museum (artefacts, archive and ecofacts). This, however, is the subject of another paper; suffice to say here that it is hoped that the NIS will play a dominant role in future discussion of such an ambitious project as a national Corpus of Anglo-Saxon Graves and Grave-Goods. So what of 'modern standards' which are implicitly in contrast to 'antiquarian'? As with many such phrases, familiarity of use belies lack of definition. 'Antiquarian' has certainly come to bear pejorative connotations, synonymous with the amateur and often politically incorrect; the verbose and descriptive above analytical in output; and a selective, collection- rather than research-driven approach to excavation. In the case of Faussett, the NIS certainly provides a challenge to this stereotype. That archaeological data is imperfect, incomplete, remains as true for 'modern' data as 'antiquarian'; the belief that data captured more recently is less imperfect, less incomplete, is simply deceptive. Definition of 'modern standards' deserves extended discussion. It is regrettable therefore, although not unremissible in the face of the scale of the task, that no statement accompanies the NIS on the aims of 'modern' twenty-first century Anglo-Saxon mortuary archaeology. It should be added, as a caveat, that pragmatic limitations remain as to how far old data can be augmented through 'modern' techniques. Excavation axiomatically remains the unrepeatable experiment, such that certain information simply cannot, ex post facto, be reconstructed from our data. The level of detail at which stratigraphic relationships have been recorded in the past - between artefacts, ecofacts and the human interment - provides a case in point: a weakness that the NIS cannot ameliorate. Indeed, a major shortcoming of the project is the lack of interpretative guidance concerning the quality of the data provided. A welcome exception is Colleen Cummings' contribution of a discussion paper on the human remains excavated by Faussett. Arguably it is not simply by amassing ever greater quantities of data that our understanding of the past progresses; rather, it is in the use to which data are put in secondary analysis and works of synthesis. Therefore, it is in the usability of the NIS that it should primarily be judged. The success of the web-delivery will no doubt rapidly earn it an indispensable place within the canon of resources for the study of Anglo-Saxon mortuary practices, to be used alongside the more traditional printed gazetteer (Meaney 1964; Geake 1997; Lucy 1998; Richardson 2005). With this in mind, a web counter would have been an instructive tool for monitoring use of the site. The information structure of the NIS is to some degree flexible. A traditional hierarchical approach can be combined with more targeted searches. In the former case, as with a printed report, the user is able to browse with ease the contents of respective cemeteries. 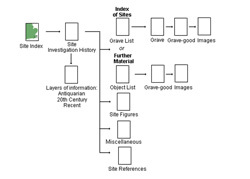 Information is layered progressively from site through grave to object level, at each complemented by metadata on excavation, analysis and curation of the archive (see fig. 2). For each of the graves a transcript of Faussett's text is accompanied by facsimiles of the published and manuscript illustrations and updated with Sonia Chadwick Hawkes' annotations, subsequent references and, where available, augmented with photographs and line drawings of those surviving artefacts. Indeed, as a resource for teaching, the accessibility of these images is a particularly exciting facet of the database: tutors and students alike will find a wealth of artefacts with which, copyright withstanding, to illustrate lectures and seminars, thus engaging a new generation. Alternatively, and herein lies the greater power of the relational database that underpins the digital corpus, users can purposefully search the archive with individual research questions in mind (see fig. 3). Nonetheless, the focus of the NIS is artefactual, on grave-goods as material culture. Much less attention has been directed to grave or cemetery context; with the exception of place-name etymologies, almost no 'new' work supplements transcripts of the original publication at this level. 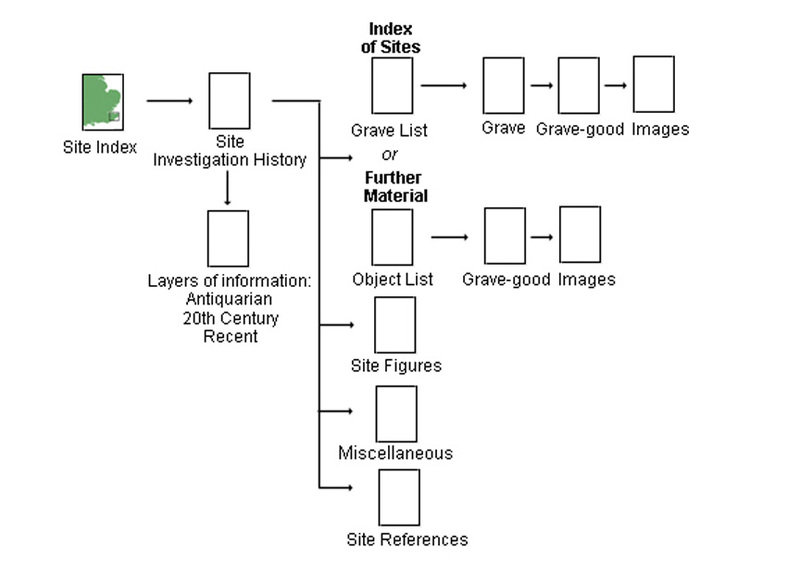 Moreover, the database exclusively facilitates 'object' searches and not those based on structural features of the grave or biological aspects of the interred. Thus, one cannot query 'barrow-burials' as a class, nor 'female burials' for example. 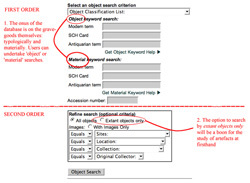 Nor can multiple variables be combined in searches using the Boolean operators AND/OR/NOT to identify groups of graves in which they coincide. A shortcoming which both demonstrates the intellectual heritage of the NIS and effectually limits its potential use by researchers not engaged primarily in artefact studies. A clear and concise 'User's Guide', accessible via the left-hand navigation column, provides information on the structure of the website and tips on how to use the database search. 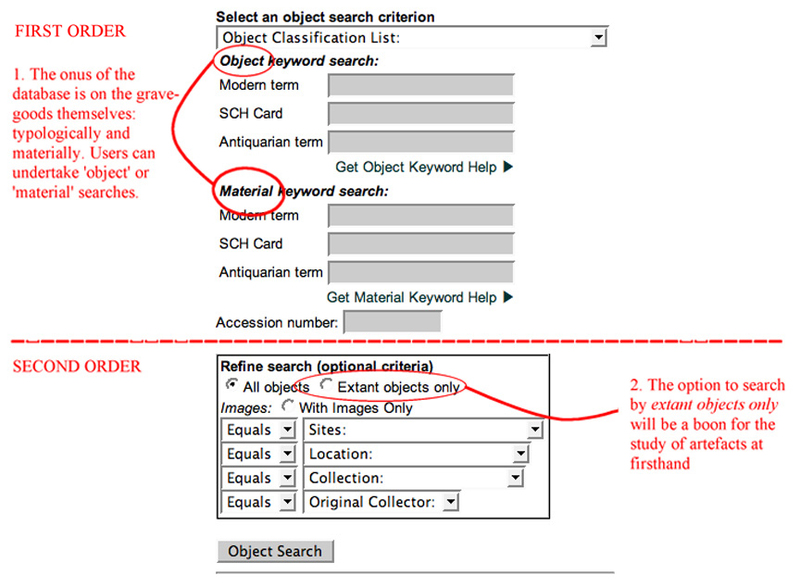 For those familiar with the format adopted by the Archaeology Data Service and with databases in general, the NIS search facility will offer no problems; a clear and very useable interface is provided. As with all databases, a degree of conformity has been applied with regards to terminology. Nevertheless, a concordance of antiquarian to modern terms facilitates integration of the data collected over the past 200 years. 'Object Classifications' have been expanded upon for the benefit of those less familiar with Anglo-Saxon artefact typologies. Thus a search for 'brooches' will also return entries formerly classified as 'fibulae'. However, simplicity has been opted for with the negative effect that particular types of an object cannot be queried independently: brooches can be searched for but not specifically square- or long-brooches for example. Searches are thereby confined to the generic. Figure 3. NIS Search Criteria. Whilst the onus of the database is on grave-goods, an inclusive approach has ostensibly been adopted: the category of 'human and animal remains' has been included in the search facility and 'organic' figures amongst the recognised 'material keywords'. This notwithstanding, the student of biological remains will be disappointed by the level of detail and volume of data available. To some extent this corroborates the observation that certain aspects of past excavation are not amenable to reconstruction after the event. However, whilst much labour went into tracing the location of artefacts and effecting their re-description and re-illustration, no such attention was paid to the human or animal remains. It is in the biological sciences that the greatest advances have been made, certainly since Faussett's day and arguably within Hawkes' lifetime. Yet ecofacts remain the poor relation to artefacts, the NIS being indicative of Anglo-Saxon mortuary studies at large. Indeed the profusion of illustrations accorded each artefact (fig 4.) is such that one wonders whether Hawkes meant for all to be incorporated or if, which is more likely, she would have given preference to the newly produced line drawing in accordance with the style adopted elsewhere in her publications (see for example Hawkes et al. 2000). One final, albeit small, point is that a little more careful copy-editing would have ensured that Faussett received his full complement of 's's and 't's: the frequent misspelling of his name is most regrettable. Owing to both the wealth of data contained within the archive and the user-friendly mode in which it has successfully been delivered, the NIS will certainly facilitate greater research into Kentish Anglo-Saxon grave-goods in particular and, it is to be hoped, Anglo-Saxon England more widely. Structural limitations withstanding, it is in the use of the NIS in future studies that its value as a research tool will truly be tested. Extensive acknowledgements attest the collaborative nature of the project and all those involved are to be commended for bringing what was potentially an unwieldy archive into the public domain. Thus to return to our beginning: the NIS is a fitting tribute to a lifetime's work dedicated to furthering the archaeology of Anglo-Saxon Kent by both Bryan Faussett (1720-1776) and Sonia Chadwick Hawkes (1933-1999). Buckberry, J. 2004 'A Cultural and Anthropological Study of Conversion Period and Later Anglo-Saxon Cemeteries in Lincolnshire and Yorkshire'. Unpublished PhD thesis, University of Sheffield. Faussett, B. 1856 Inventorium sepulchrale: an account of some antiquities dug up at Gilton, Kingston, Sibertswold, Barfriston, Beakesbourn, Chartham, and Crundale, in the county of Kent, from A.D. 1757 to A.D. 1773. London: T. Richard. Geake, H. 1997 The Use of Grave-goods in Conversion-Period England c.600-850. Oxford: British Archaeological Reports British Series, 261. Hawkes, S.C. 1990 'Bryan Faussett and the Faussett Collection: An Assessment' in E. Southworth (ed) Anglo-Saxon Cemeteries. A Reappraisal. Proceedings of a Conference held at Liverpool Museum 1986, 1-24. Stroud: Alan Sutton. Hawkes, S.C., Cameron, E. and Hamerow, H. 2000 'The Anglo-Saxon cemetery of Bifrons, in the parish of Patrixbourne, East Kent', Anglo-Saxon Studies in Archaeology and History, 11, 1-94. Hawkes, S.C. and Grainger, G. 2003 The Anglo-Saxon Cemetery at Worthy Park, Kingsworthy, near Winchester, Hampshire. Oxford University School of Archaeology Monograph, 59. Oxford: Oxford University School of Archaeology. Hawkes, S.C. and Grainger, G. 2006 The Anglo-Saxon Cemetery at Finglesham, Kent. Oxford University School of Archaeology Monograph, 64. Oxford: Oxford University School of Archaeology. Huggett, J.W. and Richards, J.D. 1990 'Anglo-Saxon Burial: The Computer at Work' in E. Southworth (ed) Anglo-Saxon Cemeteries: a reappraisal, 65-85. Stroud: Alan Sutton. Jones, S., MacSween, A., Jeffrey, S., Morris, R. and Heyworth, M. 2001 From The Ground Up: The Publication of Archaeological Projects. A user needs survey. York: CBA. Lucy, S. 1998 The Early Anglo-Saxon Cemeteries of East Yorkshire: An Analysis and Reinterpretation. Oxford: BAR British Series, 272. Lucy, S. 2000 The Anglo-Saxon Way of Death: burial rites in early England. Stroud: Sutton Publishing. Lucy, S. and Reynolds, A. (eds) 2002 Burial in early medieval England and Wales. Society for Medieval Archaeology monograph, no. 17. Leeds: Maney. Meaney, A.L. 1964 A Gazetteer of Early Anglo-Saxon Burial Sites. London: Allen and Unwin. Mortimer, J.R. 1905 Forty Years' Researches in British and Saxon burial mounds of east Yorkshire. London: A. Brown & Sons, Ltd.
Mount, F. 2007 'The thinginess of history. The beautiful and banal, the finely wrought and the falsely dated - the very stuff history is made of', Times Literary Supplement Oct 10. Available: http://entertainment.timesonline.co.uk/tol/arts_and_entertainment/the_tls/article2630657.ece. Last accessed 7 Jan 2008. Richardson, A. 2005 The Anglo-Saxon Cemeteries of Kent. BAR British Series 391. Oxford: John and Erica Hedges.